A statistical analysis of recent tweets suggests they were almost all posted between 5am and 5pm UK time, which is 8am to 8pm in Russia. Employees at a notorious “troll factory” in St Petersburg are known to work 12-hour shifts. At key moments the account has pushed Kremlin talking points, such as casting doubt on Russian involvement in the downing of the MH17 passenger jet over eastern Ukraine in 2014, and turning on Turkey after it shot down a Russian warplane in 2015. Last night the controller of the account, who claims to live in Southampton or the Isle of Wight, denied any link to Russia. He described the allegations as entirely false and “completely defamatory” but declined several requests to demonstrate that he was in Britain. His tweets, which usually pair a link to a British newspaper article with his own commentary, are frequently retweeted hundreds of times among right-wing UK users of the social networking website, with whom he has built a substantial following. 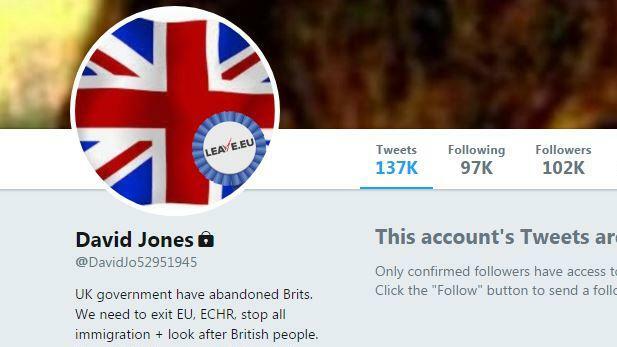 Mr Jones, whose Twitter account claims he is from “Southampton/Isle of Wight” drops in nuggets of UK popular culture into his tweets, but generally sticks to anti-EU, anti-immigration themes. However, the nature and frequency of his relentless social media posts, and the extent to which they accord with Russian hopes to break up the EU, began to attract attention. A US-based data scientist who became suspicious ran thousands of its tweets through analysis software, revealing a curious trend. 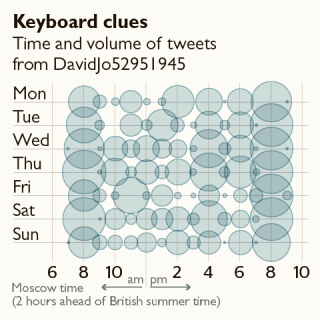 They all appeared to have been posted in Moscow office hours, between 8am and 8pm, explaining why his UK followers start receiving his daily updates at 5am. The tweets are posted every few minutes seven days a week, suggesting the account could be the full-time project of a person, or people, working in shifts. Analysing keywords revealed an increase in tweets about Ukraine and Crimea in 2014. The analysis also showed that the account appeared to be part of a web of thousands of accounts with similar names, many of which promoted hashtags linked to Kremlin agendas. The usernames — an English name, followed by a string of digits — could suggest their creator was in a rush to make many accounts as quickly as possible so accepted “default” names suggested by Twitter. Keir Giles, an expert in Russian information warfare at Chatham House, said that the user’s high standard of English, and the relative complexity of their arguments, would make it “one of the most sophisticated” pro-Kremlin accounts on social media. Ben Nimmo, of the Atlantic Council digital forensic research lab, said that such an account would be a “step up” from other Kremlin disinformation operations in Britain. Yesterday the person controlling the account said that the claim that he was connected to Russia was “made up” and “completely defamatory”, adding: “I am not pro Kremlin at all, I am just a Brexit supporter”. He declined to reveal more details of his identity, or confirm his location, beyond offering to send a picture of the Solent to prove that he lived on the south coast. Last night he switched his account to “private”, meaning it can only be seen by approved users.